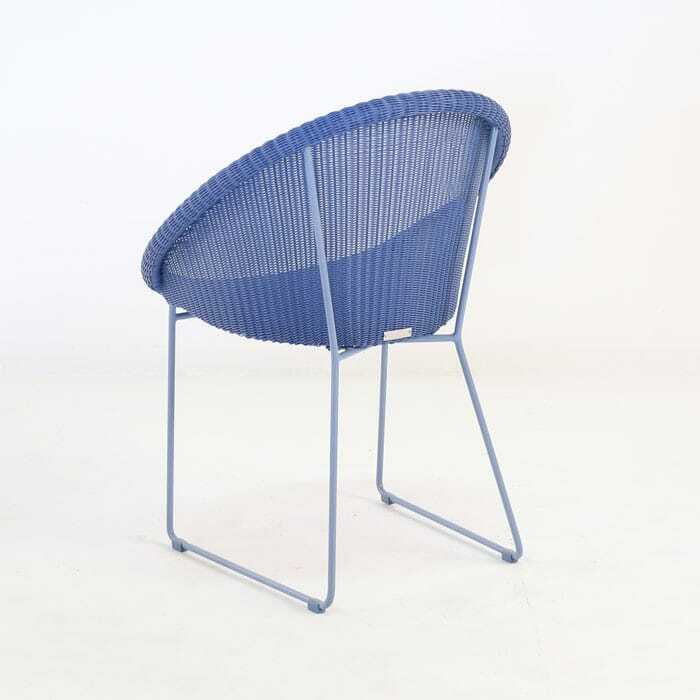 Offering a cool and fun take on the outdoor wicker dining chair, the Metro Dining Chair in Blue is a refreshing take on the tried and true, synthetic wicker outdoor dining chair. Because it’s made with Ecolene® synthetic wicker, it’s made to last, while providing you with an incredibly easy maintenance schedule (virtually non-existent) and bold style. 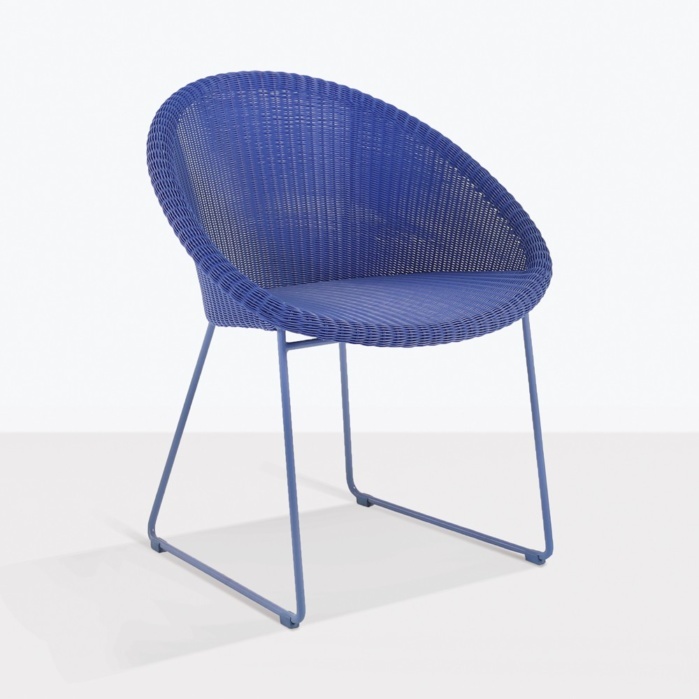 The gorgeous styling and tight weave of the Ecolene® outdoor wicker on the seating surface makes this the perfect combination of tough and durable; colorful and stylish. As far as outdoor wicker dining chairs go, the Metro offers a fun side with a flair of color you cannot find in other outdoor wicker offerings. It sets the stage for vibrant, fun filled outdoor dining events. 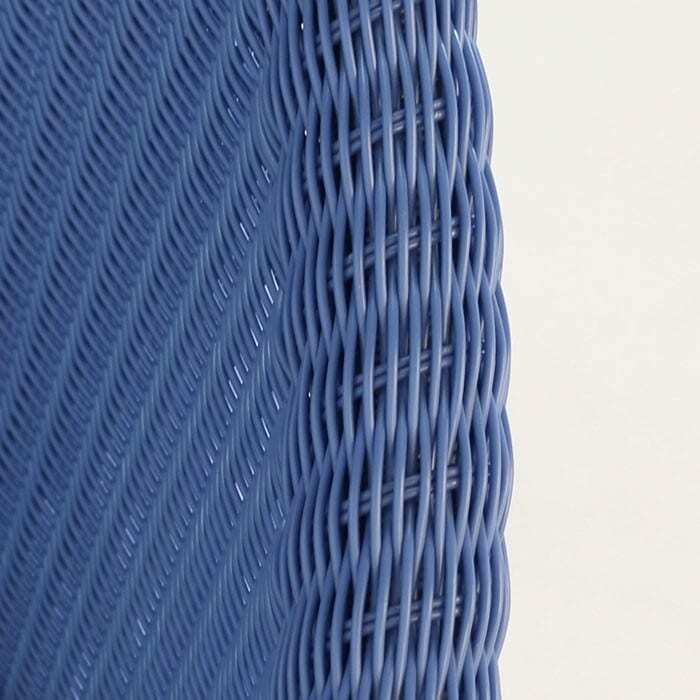 The colorfast, through dyed, extruded synthetic outdoor wicker by Ecolene® is smooth, lightweight and bright and lasts for a very long time. 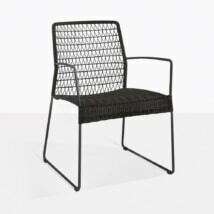 Exceeding the specifications currently as standards on the market, this wicker is a gorgeous alternative to earth tones and gives you just the right hint of bold color to offset your other, more traditional outdoor furniture. The Steel legs and frame is powder coated to provide incredible weather resistance, to match the synthetic wicker’s properties. 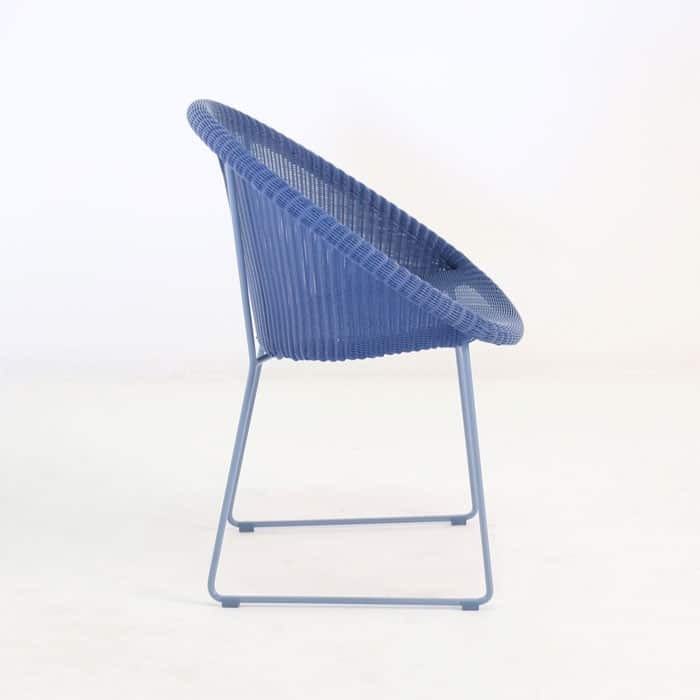 There is no sacrifice on stability, and while steel is slightly heavier than some other materials, you get the enhanced strength in a dining chair that is still very lightweight. Part of our vast collection of dining chairs, ranging from high grade polyethylene and polypropylene resin chairs to our A-Grade teak dining chairs and wicker outdoor dining chairs, the Metro chair is a beautiful addition to a variety of outdoor spaces. It has the ability to work in contrast with traditional color palettes and provide just the right splash of blue. With this beautiful range of café style dining chairs, you can find the perfect mix of outdoor dining chairs for your unique needs. Teak Warehouse has the finest portfolio of these types of chairs. At our headquarters in Los Angeles, you can find our beautiful showroom and furniture warehouse, where we house some 90,000 square feet of outdoor furniture. Our reputation has been built on our ability to deliver the finest quality outdoor furniture, with low pricing, because we are both the seller and the manufacturer, with no middlemen to increase prices. We offer an in-stock guarantee. If you see our furniture online or in the showroom, we can deliver it immediately. What’s more, we assemble our furniture, using master builders, on site, to guarantee you get a fully assembled, ready-to-use piece of outdoor furniture, quality checked at the highest level and finished expertly to last you many years. The blue color of the Metro Outdoor Wicker Dining Chair is just one bold aspect of its spectacular qualities. This chair has all the benefits of the finest outdoor dining chairs, from the ease of ownership and maintenance, to the quality construction and premium material choices. The color is simply the way this chair allows you to express yourself, with a fun and approachable, beautiful style.